Reading articles and other stuff about the horror genre and its authors, I had come across Arthur Machen’s name many times and had always meant to sample his work when time or opportunity permitted. 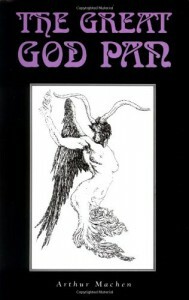 Well, it happened – a reference to a totally unrelated author and a Wikipedia search took me to “The Great God Pan” and, hence, to the Gutenberg Project, where I downloaded a copy. The plot is similar to H.P. Lovecraft’s “The Dunwich Horror” (a debt HPL openly acknowledged) – A scientist performs an operation on an innocent woman (his ward) and opens her eyes to what lies behind the “reality” that protects men from going mad. Twenty years later, the woman’s daughter (fathered by Pan) wreaks havoc amongst the British elite, leaving a trail of insanity and death in her wake. I think Lovecraft is abler at capturing the horror and utter inhumanity of the forces invoked but Machen’s effort isn’t bad. He hasn’t vaulted to the top of my list of authors to read but if further opportunities arise to read him, I will certainly take advantage.